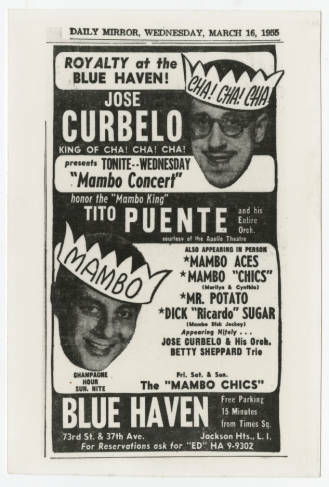 Tito Puente at the Blue Haven (73rd Street and 37th Avenue) in Jackson Heights! I would love to have watched the performance. The year on the Daily Mirror photo looks like 1955. Does anyone know what year the Blue Haven closed? wow! just wow! i'd have loved to, as well. How neat! My family immigrated from Spain and ended up in Park Slope - they had a spanish club where all of the Spaniards would meet and have dances on weekends. My great-grandmother was the club president (early feminist!) and convinced Tito Puente to come play there - we have it on film and it is so much fun to watch. I wish I could have been there (except for the fact that almost every man in the film had a cigar in his mouth). Thanks for sharing that story, Lilybell. It's wonderful that you and your family have a video to enjoy of the occasion! Re: the Blue Haven... The advertisement states that free parking is available. That would be an issue by today's standards. 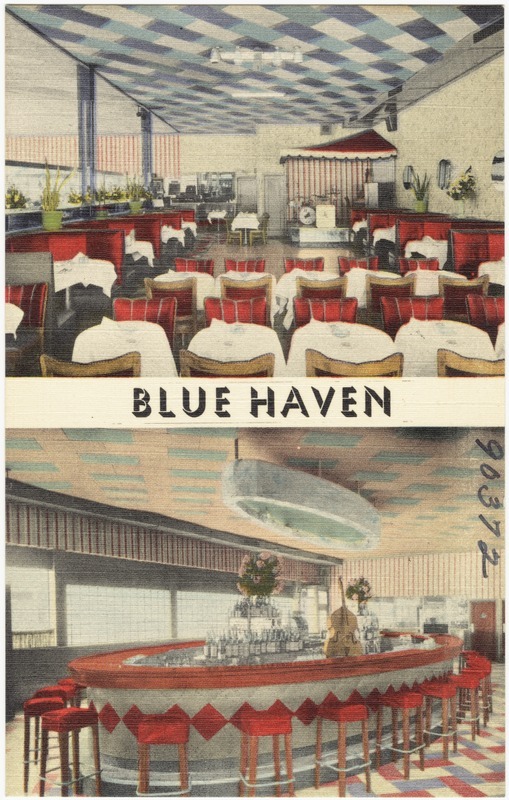 I had never seen the inside of the Blue Haven in the many times I walked past it on the way to my Boy Scout meetings in 1954. The smoked windows , the adults only atmosphere, the darkness made it something that you only peeked it to see but not for too long certainly not long enough to attract a bouncer's attention So it was an unexpected treat after all those long years to finally see what the place looked like and to even see some of the flyers for what must have been a great night out. I'd love to see the films that were made of those cigar fumed nights. Thee was another night club in those days on Northern Boulevard which wasn't really my territory (excepting those times that I went to the Boulevard Theater to see a movie) that I think was owned by Sam the Taylor whose sax was a familiar break in the old three minute Rock 'n' Roll songs. Does anyone remember that place?